Nannostomus beckfordi is an inhabitor of our big living-room aquarium. I enjoy their hoovering, the combats of the males and the different colours they display. Aesthetic fishes! 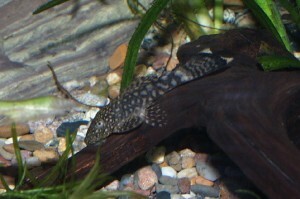 Another species that inhabits our private tank(s) is this common Ancistrus. We have many of them, less because we are so found of it but more because they reproduce rapidly and we are always in delay with catching them out of the densely vegetated and structured tanks. Some of them are by now well-trained and know exactly when the tank cover is removed for feeding and when for catchin Ancistrus. Nevertheless, they are funny guys. 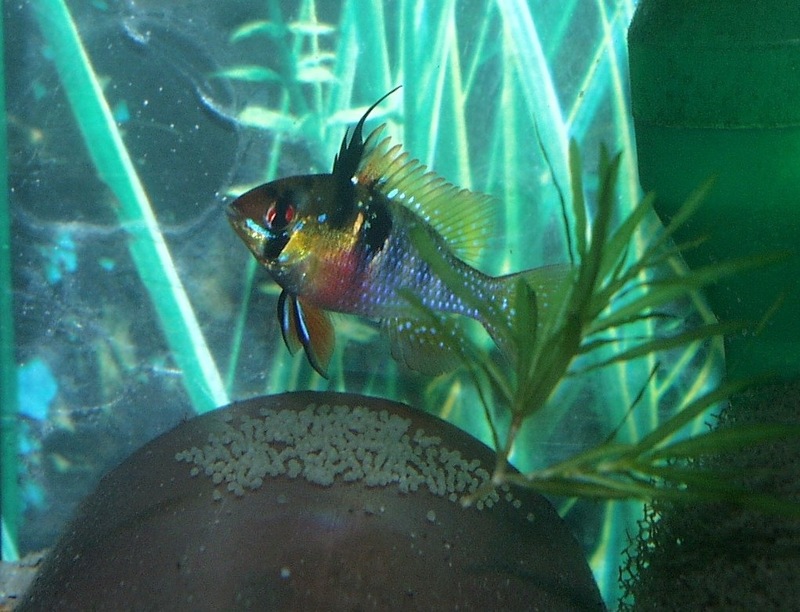 Especially nice is to observe the reproduction of your home fishes. It really let you live in the idea that your fish feel right and healthy (whatever the fish think about it I do not know). Here our proud mother of Microgeophagus (or sometimes called Papillochromis) ramirezi with a batch of eggs. This one does not belong to the fishes from the home tank, it is one specimen of my small group of swamp minnows, Eupalasella perenurus (formerly known as Phoxinus perenurus). This species I was looking for for many years and only by the very kind help of some polish ichthyologists and friends they came into my hands. 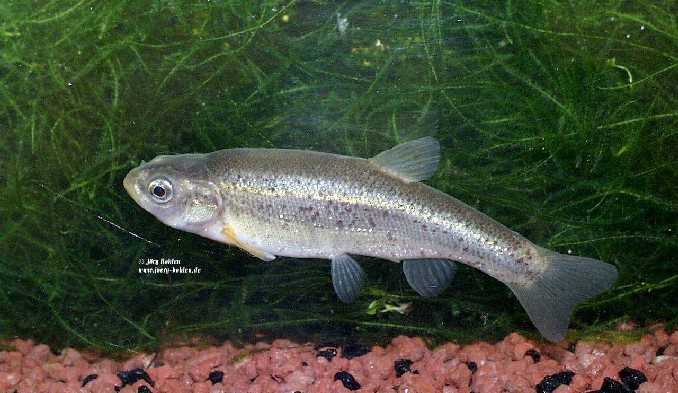 The fishes I received were captivity-bred specimens from a conservation project for this (in Poland and probably Europe) endangered little cyprinid. It inhabits swamps and heavily vegetated shallow waters which as you know became very rare and destroyed in Europe – that’s what threatens the species on its western part of distribution. Besides some few populations in Poland, it lives in (also few populations only) the Ukraine, Belarus and Russia. Outside Europe, it occurs in most of Siberia and East Asia. 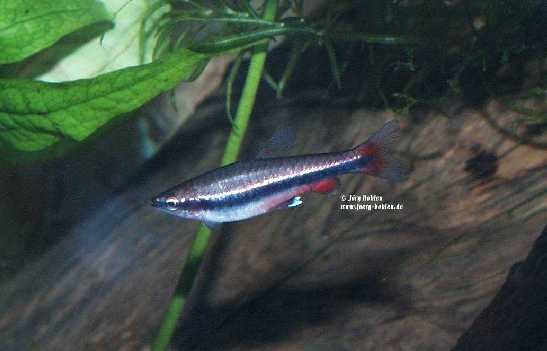 In aquarium they are quite shy and always try to hide in the dense vegetation and will come out only for feeding. This fact disappointed me a little, since I think otherwise they are fine aquarium fish. 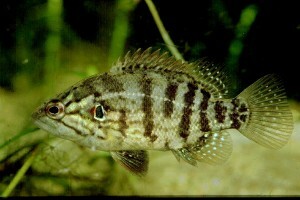 They are heavy eaters, which you can feed all types of fish food. Although they would prefer Tubifes and Chironomid larvae over dry food, they eat also flake food, tablettes and pellets from a local fishfarm. It seems like they also like some fish eggs, since even I saw the females to be with huge bellies, I didn’t find any larva. Also none of the other fishes in the aquarium (loaches, of course, don’t wonder) produces babies for two years, which was odd. Finally, in autumn this year there came suddenly together with the adults a 2 cm juvenile which I seem to have overlooked for weeks. So, now I can call myselve breeder of Eupalasella (????). Although in some swamps in the surrounding of Laka Baikal I caught Eupalasella in sizes up to 20 cm total length, the specimen in my aquarium stopped growing at a length of about 8 cm. In these siberian swamps the species was very abundant and present in all sizes, that was why I was not thinking about them to control their reproduction so strictly. However, I recently learned that a friend who keeps the second half of the initial group that came in has really bred them. I may try a little more wise next year. 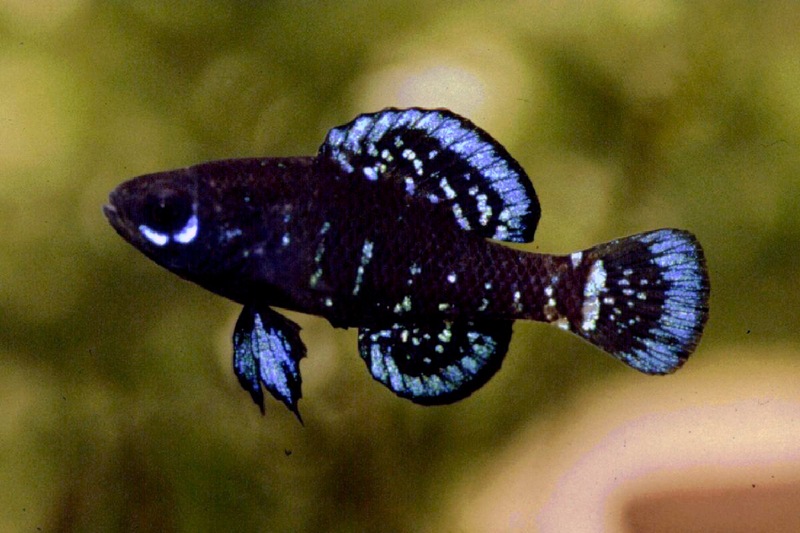 One more advice if you want to keep Eupalasella in aquarium: give the light from the top, since these fishes like many other small cyprinids always turn the back to the light, that means if the mayn source of light in your aquarium is coming from the front you see mainly their backs ;o). Another group of fishes that fascinate me are the Pygmy Sunfishes of the genus Elassoma. They are tiny fish of max. 5 cm length and are endemic to southeastern Northamerica. The genus Elassoma is the only genus within the family Elassomatidae, but contains only six species. 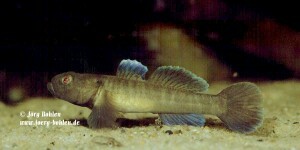 Pictured is a male of the species E. okefenokee. Also a beautyful inhabitor of an aquarium with room temperature is this little goby, Padogobius bonelli (Synonyme is P. martensi), from northern Italy.